Welcome to the Holiday Inn Express Hotel & Suites Phoenix-Chandler just off Interstate 10 and Chandler Boulevard. We are located in a suburban area close to Intel, ADP, Honeywell and Global Crossing. Enjoy wireless Internet access in all areas of the hotel. Our complimentary breakfast offers hot items including cheesy omelets, sausage gravy & biscuits, bacon, scrambled eggs & sausage patties. Check email or print boarding passes in our business center. Our meeting room accommodates up to 40. We offer a larger work desk in our guest rooms and two phones. Guests coming to our area for leisure activities will enjoy our outdoor heated pool with whirlpool, and guest laundry. Workout with confidence in our fitness room which features state-of-the-art equipment. Detailed area information is available at our front desk. Golfers, we have several great courses just a short distance from the hotel. Nearby fun spots include Firebird International Raceway, Rawhide Western Town, Gila River Casino, and shopping centers.We are a short drive to Phoenix Sky Harbor Airport, ASU, Phoenix Zoo and hiking trails. 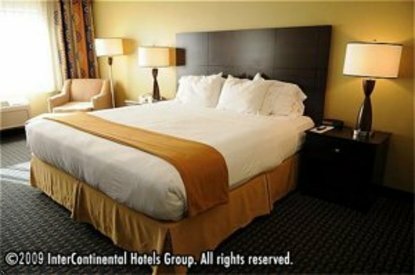 Whether your visit to the Phoenix/Chandler area is for business or pleasure, you&regre just a few clicks away from experiencing the Holiday Inn Express Hotel & Suites &reg Phoenix-Chandler. This hotel is committed to providing accessible facilities under the American Disabilities Act. If your accessibility needs are not met, please contact the Hotel Manager on Duty. Should you require additional information regarding accessible facilities for guests with disabilities, please call 1-800-Holiday (U.S. and Canada) or contact the hotel directly. For the hearing impaired, TDD service is available at 1-800-238-5544 within the U.S. and Canada.